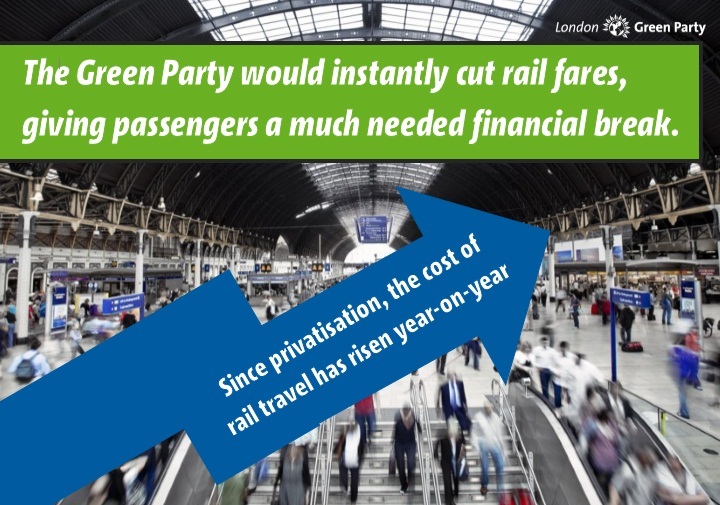 As railway ticket prices rise yet again Green Party Co-Chair Tom Chance speaks out against the way the network is run "purely for the benefit of private corporations", explaining how the Green Party would cut fares by up to 12% and work to bring the railway back under public ownership. As passengers are hit by yet another New Year's price hike, the Green Party has announced that it would introduce an immediate cut in the cost of rail fares of up to 12%. Ticket prices across the network will increase by an average of 2.2% this New Year. The planned rise is above the level of inflation and follows successive years of ticket price increases. The cost of rail travel is now increasing at three times the rate of average wages, leaving many passengers out of pocket. Arguing that action is urgently needed to ease the financial burden being placed on public transport users in Britain, the Green Party has said it would introduce an immediate cut in rail and bus fares by increasing the investment in public transport paid for by the government by £1.7bn per year. Under the plans announced today, the Green Party would cut the cost of an annual Zone 1-4 London Travelcard by £184 and reduce the cost of a Zone 1-2 tube ticket from £2.80 to £2.60. Passengers traveling between Crystal Palace and London Bridge – one of the capital’s busiest routes – would benefit from savings of up to £115 per year. “The way the rail network is being run purely for the benefit of private corporations clearly isn’t delivering for the public. Just as with rocketing house prices and escalating food bills, passengers feel like they’re being made to climb a mountain that seems to go on for ever whilst being loaded up with more baggage with every step they take. In demonstration against the planned ticket rise, a national protest is today taking place across the railway network calling for the railways to be brought back into public hands. The “Public Ownership of Railways Protest” will take place from 07:00 to 19:00 at stations across the country with demonstrations in London organised for King’s Cross, St. Pancras, and Waterloo stations. To coincide with the demonstrations, Green Party MP Caroline Lucas will also be presenting her Private Members Bill calling for the railways to be brought back into public ownership to parliament.